In Egypt, 'Third Square' Protesters Seek Middle Road Growing numbers of Egyptians are turning against the generals, politicians and youth group credited with sparking the popular groundswell that led to the ouster of President Mohammed Morsi less than a month ago. Some are joining Third Square, a new movement that's emerged as a result of growing discontent. Activists from a group called "Third Square," which promotes a middle way in the rift between the Muslim Brotherhood and supporters of the army's overthrow of Egyptian President Mohammed Morsi, shout slogans as they gather to oppose both parties at Sphinx Square in Giza on July 30. Tensions are running high in Egypt, as supporters of ousted Egyptian President Mohammed Morsi continue their protests. But they aren't the only ones. Barely two weeks after Morsi was toppled in early July, a new protest movement emerged on the scene in Cairo. Called the Third Square, the group aims to keep tabs on the military, the interim government and Muslim Brotherhood, to keep them from returning Egypt to autocratic rule. A new protest group, Third Square, is trying to attract disillusioned Egyptians. It's trying to lure disillusioned Egyptians with online videos. In one, an unshaven man with a cigarette dangling from his lips takes laundry off a drying rack. He looks listless and disinterested — meant to portray Egyptians who have given up all hope amid the never-ending turmoil. The song played in the background is about Egypt's revolution turning into a "zucchini" — a local metaphor for bad or mismanaged. Third Square says its goal is to return Egypt to the path of establishing a functioning democracy. The group attracts a few hundred people at one recent protest held at Sphinx Square in Giza, across the Nile River from Cairo. Their chants call on Egyptians to stand up as one national movement against the military and the Muslim Brotherhood. "We don't need to choose between two things every time," says Shadi Galal, an architect and spokesman for the group. That idea appeals to teacher Mai Abdel Razeq, who has come with her older sister to check out Third Square. "We just hope there'll be some change, God willing," says Mai. Ahmed Maher is one of the leaders of the April 6th Movement, which has played a key role in protests in Egypt even before former President Hosni Mubarak was ousted in 2011. Maher says the growing discontent doesn't surprise him. He says Egyptians were united in one goal last month, and that was to remove Morsi from power. Now that he's gone and the Muslim Brotherhood's political power is weakened, people are starting to question whether letting the military play such a pivotal role in the transition was a smart move. 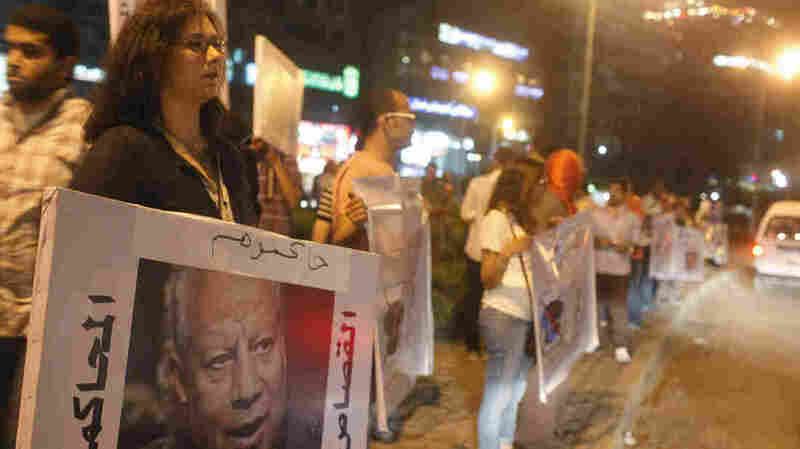 Many are also bothered by the interim government's giving the military and security forces expanded powers to interfere in civilian affairs just as they did in Mubarak's era. What Egypt is doing right now is repeating the same mistakes, only doing so with much greater enthusiasm and speed. "What Egypt is doing right now is repeating the same mistakes, only doing so with much greater enthusiasm and speed," Brown says. "All of the plots in the 2011 transition — a rushed constitutional process, a failure to hammer out consensus on basic issues, a complete trust in the military — those are all being repeated." These mistakes could spark a new round of protests by various youth and revolutionary groups that worked for the ouster of both Morsi and Mubarak. But they are unlikely to lead to any real change, says Ashraf El Sherif, a political science professor at the American University in Cairo. "They lack organization, they lack financial resources, they lack leadership, they have a lot of problems and a political program concerning the short-term consideration," he says. "That's their problem." Across town at the offices of the Egyptian Initiative for Human Rights, Karim Ennarah says breaking the cycle of protests will be difficult. "Egypt has deep structural problems with economics and with social justice and with political participation that will not be resolved by any of these parties," Ennarah says. He predicts that given the prospects of a drawn-out struggle between the military and the brotherhood, those reforms won't happen for years to come.